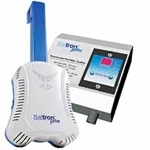 The Solaxx Saltron Retro salt water chlorine generator is a “self-contained”, “retro” style unit that produces pure chlorine without the need for an installation process and can handle pools up to 20,000 gallons. Mostly intended for above ground pools do to it’s no fuss, virtually non-existent installation requirements but can also be used in in-ground pools. This affordable unit requires no plumbing to install nor electrical work to connect to power. Suitable for both in-ground or above ground swimming pools, simply position the cell assembly near your pump return outlet in the pool and connect to the control unit. Without the need for plumbing, the system relies on water movement generated by your existing pump/filtration system to circulate the generated chlorine around the pool. Thus the chlorinator cell will need to be placed somewhere close to your return outlets from the pump. For the price, and given the number of positive reviews, this is a simple no fuss option for smaller pool environments. Like most good units, the Solaxx Saltron Retro features the common reverse polarity self cleaning system keeping maintenance levels low. It also has an automatic shut-down to protect the system. Solaxx recommend inspecting the cell every 3 months for calcium/mineral build up. Cleaning the cell is fairly simple – it involves filling a bucket or similar container with a muriatic acid solution (the manufacturer recommends a mixture of 80% water and 20% muriatic acid) and submersing the cell for 20 minutes. Rinse and repeat depending on how clean the cell is. 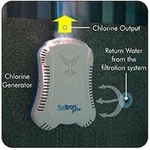 The Solaxx Saltron Retro chlorinator is super simple to use. All you need to do is set hour many hours per day you want the chlorinator to produce chlorine for. 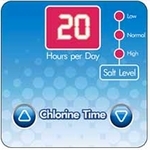 The level of chlorine produced for the pool is determined by the number of hours you have set the unit to generate chlorine for. For the first couple of weeks, continue to test the chlorine level of your pool and adjust the operational hours accordingly until you find the correct run time for your situation. The system conveniently also has 3 LED indicators to provide you with a status of the salt levels in the water. This unit is covered by a manufacturer’s warranty of 12 months from date of purchase. Not a bad cover given how inexpensive this unit is. Converting to a salt water pool could not be simpler with this unit.